Powerful, secretive, solitary—the cougar is one of Canada's most enigmatic predators. They can swim and climb skillfully, can jump more than six meters, and their natural beauty in the wild is absolutely breathtaking. To honor these graceful cats, the Royal Canadian Mint chose the cougar for the second year of its famed Wildlife Series, a 6-coin collection which also features the Timberwolf, Grizzly, Moose, Pronghorn Antelope and Wood Bison. This hugely popular coin series is struck from .9999 pure silver in a style made famous by the Royal Canadian Mint's Silver Maple Leaf bullion coins, and the quality of its craftsmanship makes the Wildlife Series a must-have for the serious collector. But you must act fast. 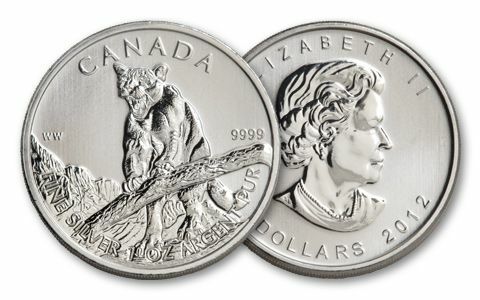 The $5 Brilliant Uncirculated Canadian Silver Cougar coin is as rare to find as the cougar itself. Fortunately, you can still get yours from GovMint.com, today. A rare and beautiful predator celebrated beautifully in .999 Pure Silver! These $5 Canadian Silver Cougar coins are literally flying off the shelves of distributors, and the moment you hold one of them yourself, you'll know why. The image of the ferocious feline comes alive across the coin's 38 mm-diameter surface, and the coin's impressive weight of 31.1 grams leaves a lasting impression. AN ENDANGERED SPECIES, CAPTURED IN WILD SPLENDOR-- The Wilderness Series, which launched in 2011, was intended to showcase some of Canada's most majestic creatures—and the cougar coin is perhaps one of the best examples in the entire series. Your stunning .9999 pure silver coin features a reverse with the image of a ferocious cougar, its paws on a branch, roaring in front of a mountain vista. Inscribed on the reverse are the words "CANADA," "FINE SILVER 1 OZ ARGENT PUR," as well as the purity rating of 9999. The initials WW are also represented, denoting designer and Senior Royal Canadian Mint Engraver, William Woodruff. 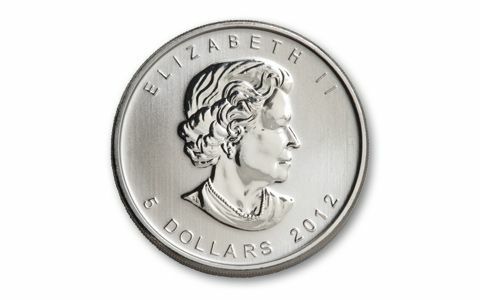 The obverse of the coin, based on a design created in 2003 by Canadian portrait artist Susanna Blunt, displays a bust of Queen Elizabeth II facing right. The obverse also includes the inscriptions "ELIZABETH II," "5 DOLLARS" and "2012." NEVER CIRCULATED, ETERNALLY PRISTINE-- Your coin is certified in brilliant, uncirculated condition, accompanied by a Certificate of Authenticity and housed in a plastic vinyl flip case. Coins of the Brilliant Uncirculated grade are mint-perfect, having never been used in commerce. GENUINE LEGAL TENDER -- Though the value of your coin goes far beyond its denomination, the legal tender of this coin is $5 Canadian. 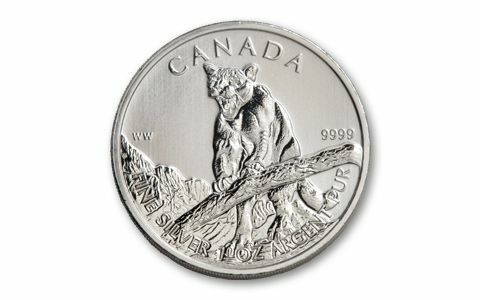 The endangered cougar is already difficult to find in the wilderness of Canada--and the 2012 $5 1-oz Silver Brilliant Uncirculated coin is proving equally elusive. Don't miss your chance to complete your wilderness collection…contact GovMint.com, today.